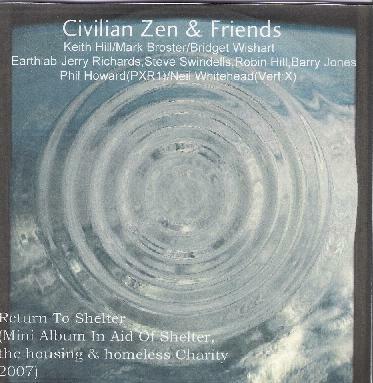 Civilian Zen - "Return to Shelter"
Return to Shelter is the second volume of the multi-musician project organized by Keith Hill for the Shelter Charity in the UK (see review of Songs for Shelter in AI #35). Participants on this new one will certainly appeal to space rock fans. We've got Jerry Richards (Earth Lab, Hawkwind), Steve Swindells, Phil Howard (PXR1), Neil Whitehead (Vert:x) and ex-Hawkwind vocalist Bridget Wishart, who all of a sudden seems to be cropping up everywhere, which is GOOD because she's got such a great voice for this music. The CD opens with "From Andromeda to Anywhere", an eerie spaced out atmospheric introductory piece with brief spoken word. This leads into "Rubicon", which is very similar but sets a steady rhythmic pace. So far it's all very moody and conjures up images of moving slowly across some deserted planet landscape. "Curse/Cure" is an excellent Hawkwind inspired space rock song with chunky guitar chords and Bridget on vocals. "Nothing Exists" starts off with space electronics, tabla and Robert Calvert styled spoken word. After a few minutes the same theme continues but with a pounding techno pulse added in. "The End of Religion" features Jerry Richards and the Earth Lab gang doing what's mostly a down 'n dirty space blues tune, but gets dreamier near the end. I really like this off-the-beaten-path song. "Nocean" is a short atmospheric piece that's credited to Bridget but doesn't have any vocals. "Self Destruct" is a Phil Howard/Keith Hill collaboration that's another space-techno piece. I like how the music will be dance floor mania but then the beats will recede and bring in sitar and a general Eastern vibe, before launching back into the techno. And back and forth it goes. Pretty cool. "The Eighth" is an excellent instrumental that blends space rock and progressive elements. "Scream Dream" is another space techno track but this one is a song with vocals. And "Sublime Revelations" is a short track with efx'd spoken word that brings the album to a close. Pick up this very cool space rock album and help a good cause! For more information you can visit the Civilian Zen web site at: http://www.myspace.com/civilianzen. For information on the shelter organization visit http://www.shelter.org.uk.